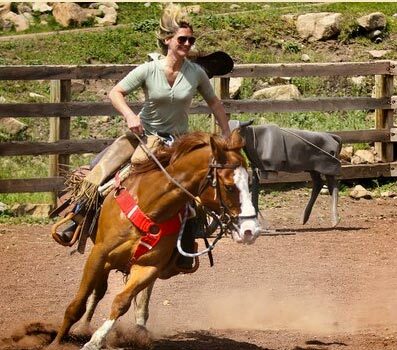 Grab your cup of coffee and read on to get a sense of the Colorado dude ranch life from guests who have visited. These campfire stories are sure to warm your heart and exercise your imagination! My husband was beside me and two sons followed behind. Their horses were younger; a little friskier, which served them well—my kids enjoyed picking up the pace on occasion. By the end of our weeklong stay at the Colorado dude ranch they seemed to have changed. No longer just “city” kids, they had been touched by the invaluable experience one can only get with horses, campfires and midnight stargazing. Dylan, my son, is fifteen and more interested in looking at the world on a computer screen than experiencing it in person. Most days, his father, Jim, and I aren’t much better. Today is different, though. Today, we are all standing in frigid clear Rocky Mountain water that swirls around our ankles, knees and thighs, seeming to suction from one side as it pushes on the other. Just standing firm against the current is more of a workout than I’ve had in months, but Dylan isn’t complaining. He’s as focused as Jim and I are, because today, we have a common foe. To begin with, we made our reservations for an adults-only week in September. My hotdogs-and-beans theory vanished with meal one meal.